People with equinus develop ways to “compensate” for their limited ankle motion—and this often leads to other foot, leg, or back problems. The most common methods of compensation are flattening of the arch or picking up the heel early when walking, placing increased pressure on the ball of the foot. Other patients compensate by “toe walking,” while a smaller number take steps by bending abnormally at the hip or knee. spasms may be signs of an underlying neurologic disorder, such as cerebral palsy. Most patients with equinus are unaware they have this condition when they first visit the doctor. Instead, they come to the doctor seeking relief for foot problems associated with equinus. To diagnose equinus, the foot and ankle surgeon will evaluate the ankle’s range of motion when the knee is flexed (bent) as well as extended (straightened). This enables the surgeon to identify whether the tendon or muscle is tight and to assess whether bone is interfering with ankle motion. X-rays may also be ordered. In some cases, the foot and ankle surgeon may refer the patient for neurologic evaluation. Treatment includes strategies aimed at relieving the symptoms and conditions associated with equinus. 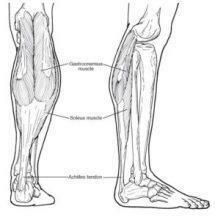 Achilles tendon when walking and may reduce symptoms.